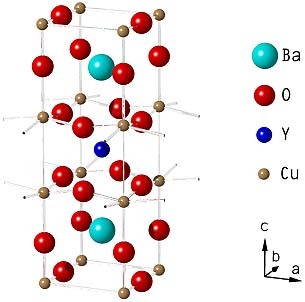 The high-temperature superconductor YBa2Cu3O7 was discovered in 1987 by M. K. Wu et al. as the first superconductor with a transition temperature above the boiling point of liquid nitrogen (77 K) (M.K. Wu et al. , Phys. Rev. Lett. 58 , 908 (1987)). Crystalline structure of the high-temperature superconductor YBa2Cu3O7, rendered by POV-Ray.